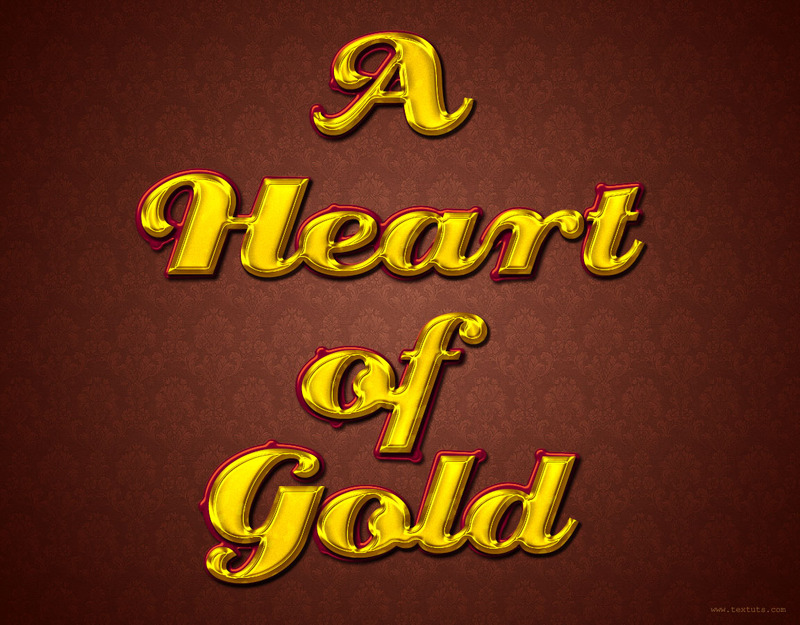 This tutorial explains how to use Layer Layer Style and Filters to create an elegant shiny gold text effect. Open the Damask blueish image, then go to Edit -> Define Pattern, and click OK. Create a new 1152 x 900 px document. Then, Set the Foreground color to #8a5240 and the Background color to #310901. Pick the Gradient Tool, choose the Foreground to Background gradient, and fill the Background with a Radial Gradient from the center of the document to one of the corners. Pick the Paint Bucket Tool and choose Pattern in the Options bar, then choose the pattern you’ve just defined. 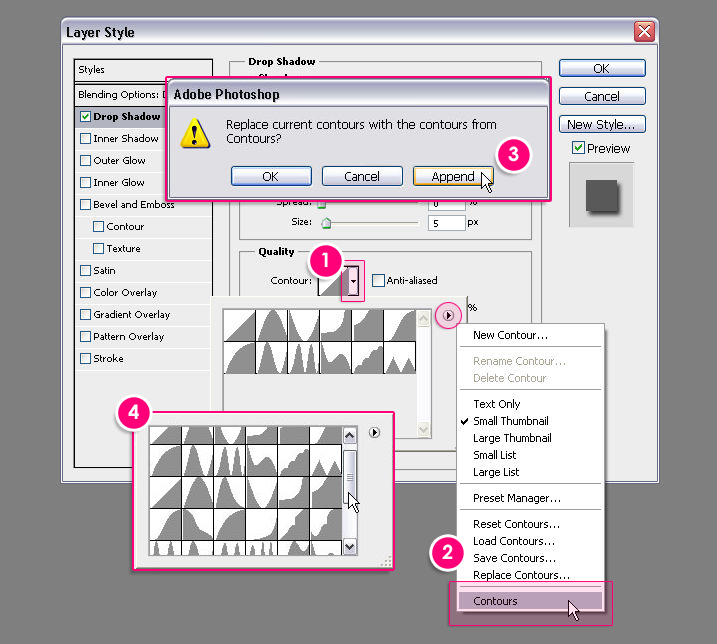 Create a new layer and call it Pattern then fill it with the selected pattern. Change the Pattern layer’s Blend Mode to Overlay and the Opacity to 60%. Create the text using the color #928427 and the font Creampuff. Set the Leading value to 200 and the Anti-aliasing method to Sharp. The gradient uses two colors#a17713 and #fac50f. This will create the main “gold” effect. Create a new layer on top of all layers and call it Texture. Then set the Foreground color to #ffef48 and the Background color to #593809. Go to Filter -> Render -> Clouds, then press Ctrl/Cmd + D to get rid of the selection. Change the Texture layer’s Blend Mode to Soft Light and its Opacity to 30%. 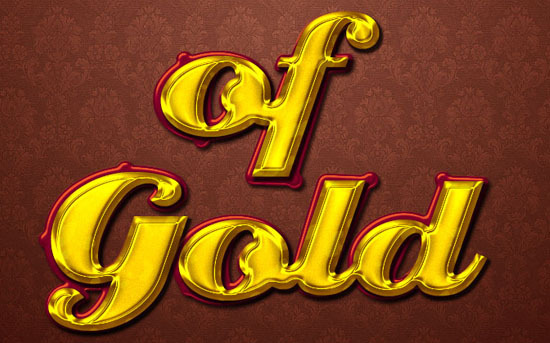 This will create a nice reflection-like effect for the golden text. Set the Foreground color to #9e0039, pick the Brush Tool, then open the Brush panel (Window -> Brush). Make sure to choose Pen Tilt from the Control drop down menu. Right click the text layer then choose Create Work Path. Create a new layer right below the text layer and call it Stroke, then pick the Direct Selection Tool. Choose Brush from the Tool drop down menu and check the Simulate Pressure box. This will stroke the path with the modified brush. This will add more depth to the original effect and make it bolder. With the same brush, add some dots on the stroke, just a couple. Change the adjustment layer’s Blend Mode to Soft Light and its Opacity to 50%. Then, click the Gradient box to create the gradient used. You need two colors#6b3b37 to the left, and #d1a799 to the right with a Location value of 92. This will make the colors brighter and more vivid. And that’s it. Simple yet elegant! Hope you liked it. I think the texture values are off…I tried several times but when I got to the paint daubs part I was just getting a yellow overlay. I’ve just re-checked those values, and they are correct. Did you make sure to choose “Light Rough” from the “Brush Type” drop down menu? Also, is your text the same size as in the tutorial? And did the other two filters work as supposed to? The text size might affect the result, so try playing around with the Brush Size and Sharpness values to see if you can get a different outcome. In step 2, is the size of Bevel & Emboss 18 or 10? In the picture, you typed 10 but 18 in the text? That’s 10, as in the image. sangat bagus…,saya dari Indonesia suka desain-desain anda yang sangat kreatif..
As for the stroke, no, you don’t have to repeat it. If I misunderstood your question please feel free to add a reply. great tut well written !! great share author ! Right moment.We are going to celebrate the 50th anniversary of our marriage and that’s a golden in Belgium. That’s awesome! Glad you’ll use this effect. I like the effect very much, it is probably the best gold effect available on the internet at this moment! Oh wow! This sure means a lot. Thank you very much for the great compliment. Very clear instructions and it was just the styling I was looking for. Thank you! You need to load the Contours first, check this image please. Brilliant photoshop text effects, Keep it up! Thanks a lot for the comment and the support. Wow! This really really means so much. hei masbro.. Its really great gold effect!! But why my work doesn’t look like ur 🙁 its just yellow and orange. I used 250pt font size too. Seems you are using a different font, and it is bolder. So you might need to use bigger layer styles’ values for the effects, specially the Bevel and Emboss effect. Make sure you are changing all of the used values as well. Really, really good! Thanks so much for this nice work. First: Your tutorials are outstanding. Second: I could not achieve the same results as you did. Therefore I downloaded the zipfile.Unfortunately I can’t unzip it. Got this message from Winzip (14.5): End-of-central-directory signature not found. Either this file is not a Zip file, or it constitutes one disk of a multi-part Zip file. Which step didn’t work the same for you? I checked the link, and it worked fine, I haven’t received any other comments that it’s not working. But I re-uploaded the file anyway, so can you try downloading it again please? Please feel free to add a reply with more details. That’s really great to know! You can select and copy/save the tutorial. Unfortunately, we don’t have other options for that right now. But since you mentioned the problem, we’ll make sure to take the suggestion into consideration indeed. There aren’t other sites dedicated for text effect tutorials, that’s why textuts rocks! – just kidding ^_^. But there are many Photoshop tutorial sites that have text effect tutorials sections. and you can also check some directories like PhotoshopRoadmap and Tutorialized. Thank you very much.. this help me a lot. Thank you very much for this tutorial. I really enjoyed making this one! 😀 Totally appreciated!